The Ejendals Tegera 913 Level D Cut Resistant Gloves are ideal for cut risk applications within the food industry, with a light blue design that is easily detectable against most foodstuffs. 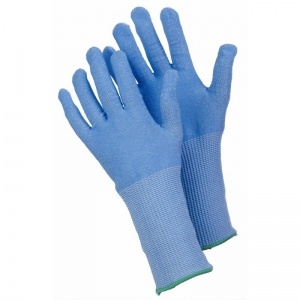 In order to provide extra protection and comfort around the wrist area, these gloves feature an extended knitwrist cuff. The Ejendals Tegera 913 Gloves feature Ejendals' proprietary Cut Resistant Fiber (CRF) technology, which is designed to provide exceptional dexterity, a quality that is not usually present in high-performance cut protection gloves. The Ejendals Tegera 913 Gloves are available in six different sizes. Please consult the table below for details and select the size you require from the drop-down menu above.